March 22, 2006: Consider a pair of brothers, identical twins. One gets a job as an astronaut and rockets into deep space. The other stays on Earth. When the traveling twin returns home, he discovers he's younger than his brother. This is Einstein's Twin Paradox, and although it sounds strange, it is absolutely true. The theory of relativity tells us that the faster you travel through space, the slower you travel through time. Rocketing to Alpha Centauri—warp 9, please—is a good way to stay young. 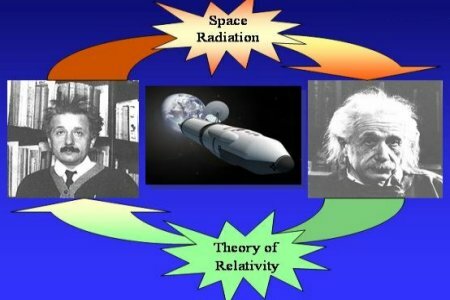 "The problem with Einstein's paradox is that it doesn't fold in biology—specifically, space radiation and the biology of aging," says Frank Cucinotta, NASA's chief scientist for radiation studies at the Johnson Space Center. While the astronaut twin is hurtling through space, Cucinotta explains, his chromosomes are exposed to penetrating cosmic rays. This can damage his telomeres—little molecular "caps" on the ends of his DNA. Here on Earth, the loss of telomeres has been linked to aging. So far, the risk hasn't been a major concern: The effect on shuttle and space station astronauts, if any, would be very small. These astronauts orbit inside of Earth's protective magnetic field, which deflects most cosmic rays. But by 2018, NASA plans to send humans outside of that protective bubble to return to the moon and eventually travel to Mars. Astronauts on those missions could be exposed to cosmic rays for weeks or months at a time. Naturally, NASA is keen to find out whether or not the danger of "radiation aging" really exists, and if so, how to handle it. Science is only now beginning to look at the question. "The reality is, we have very little information about [the link between] radiation and telomere loss," says Jerry Shay, a cell biologist at the University of Texas Southwestern Medical Center at Dallas. With support from NASA, Shay and others are studying the problem. What they learn about aging could benefit everyone, on Earth and in space. Like the fuse of a time bomb, telomeres are long strands of repeating DNA that shorten each time a cell divides. When the telomeres become too short, the cell's time is up: It can no longer divide, a state of affairs known as "replicative senescence." One current theory of aging holds that, as the cells of a person's body start to hit this telomere-imposed limit, the lack of fresh, new cells causes the typical signs of aging: wrinkled skin, failing organs, weaker immune system, etc. Whether or not telomere loss actually causes aging remains a matter of debate, Shay notes. The fact that shortened telomeres go hand in hand with aging is well documented. People with shorter telomeres, for example, are known to not live as long on average as people with longer telomeres. But mere correlation doesn't prove whether telomeres are in fact the cause. "It's hard to prove cause and effect in these things. But I think there's a sufficient number of these correlative studies from a variety of different investigators that one has to start believing that short telomeres are a marker of aging," Shay says. 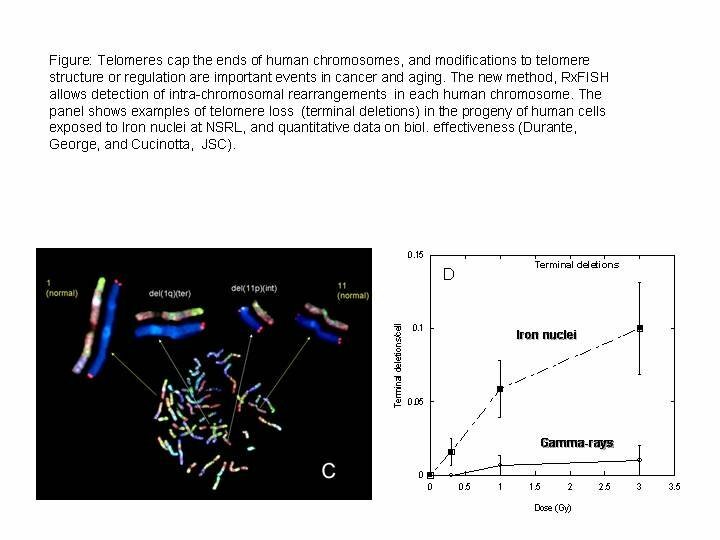 Recent research, performed by Frank Cucinotta and colleagues, showed that iron-nuclei radiation (a chief component of cosmic rays) does indeed damage the telomeres of human cells: reference. "We had this surprising result that iron particles are much more damaging to telomeres than gamma rays," Cucinotta says. He suggests that this difference might be due to the wider path of damage caused by iron nuclei. Telomere strands wrap into elongated loops, like little knots on the ends of chromosomes. Gamma rays can only strike one side of these loops or the other, but iron nuclei can affect both sides at the same time, inflicting lasting damage on the telomere—possibly causing its complete deletion. This explanation is still speculative, however. "We're talking about subtle things. These people are probably not going to wind up in wheelchairs or something like that from being in space," Shay says. "It is looking more and more likely that this could be a problem for long-term space travel," Cucinotta says. However, if scientists can tease apart the exact ways that iron-particle radiation affects telomeres, they may be able find a way to avoid or correct it. The solution could be as simple as a pill containing DNA-repair molecules. "There are many ways that we can intervene," Shay says. Editor's note: This story should not be construed to mean that Einstein's theory of Special Relativity is wrong. It is correct. The Twin Paradox was concocted in Einstein's day to illustrate time dilation only. It was never intended to treat all aspects of space travel. The newly discovered effect of space radiation on telomeres is the "paradox on the paradox," says Frank Cucinotta. Shay, J.W., and Wright, W.E., 2001. Aging. When do telomeres matter? Science 291, 839–840.